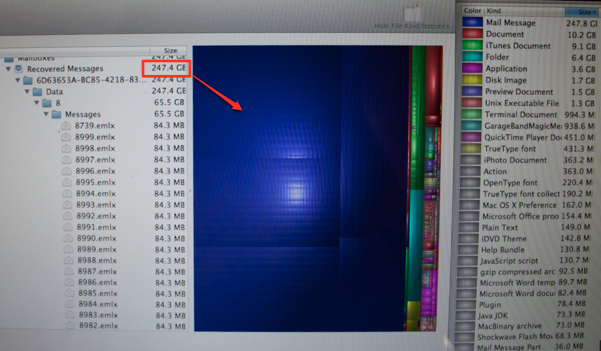 Wifi problems on the new 27″ iMac – using iStumbler from istumbler.net helped us analyze the problem (and buy a new simultaneous Airport Extreme). Disk Inventory X from derlien.com helped find a crazy disk space problem on my neighbors computer. Caleb Fong, aka Geekosupremo gives us a rundown on a wild process he follows to edit video. Summer72H tells us about a free iOS app called Alarmed from yoctoville.com. Ken Wolfe of the Manhattan Repertory Theatre in New York City gives a review of an iOS productivity app Clear by RealMac Software. Rod Simmons from the Simple Mobile Review Podcast reviews the Shure SE535 noise isolation headset. George from Tulsa tells us the end of his saga to save money on his T-Mobile bill. In Chit Chat Across the Pond Bart explains the schizophrenia that is Apple’s approach to security. Hi this is Allison Sheridan of the NosillaCast Mac Podcast, hosted at Podfeet.com, a technology geek podcast with an EVER so slight Macintosh bias. Today is Sunday May 6th, 2012 and this is show number 365. On last week’s show, I’m afraid Quality Control Director Steve really fell down on the job. One of his many responsibilities is to scan through the audio file and make sure there’s no glitches. Well there WAS a glitch – the music for Chit Chat Across the Pond was not in it’s correct place, but he didn’t do his usual scan and so it was missed. I assure you that he is on notice to not slip up like this again. Now on to my mistake. last week in the intro I promised a review by Caleb Fong, but I never played it! not sure how that happened but the good news is that gives me even more help for this week’s show. I promise THIS week i’ll play Caleb’s review. As you all know, Mipples was returned home after I succumbed to the ransom demands to get Steve a 27″ iMac. Steve was delighted with it – as well he should be as I kind of went over the top – the highest end core i7 processor, 16GB of RAM and a 256GB SSD and a 1TB SATA drive. But it wasn’t all happiness in the Sheridan household, because the iMac kept dropping the wireless connection. He pretty much lost his connection every 5-20 minutes. You can imagine his frustration to have such a high end machine that would barf on him like this. I exhausted my vast network knowledge by changing the channels on the router but that was all I had in my bag of tricks. The frustrating thing was that our current wireless network works fine for 2 iPhones, a Blackberry, 2 iPads, 3 TiVos, an AppleTV, 2 Bluray players, 2 PCs, and 4 Macs, just not on this brand spanking new iMac. He finally buckled down on Saturday and called Apple. He went through a lot of configuration changes with the AppleCare people, getting rid of configuration files and again changing all the channels but still the iMac dropped the connection. Finally he got to third level support, and the answer from the tech was very interesting. He believed the problem was interference from other wireless access points nearby. Again this didn’t make sense because all of our devices were working but the new iMac. To talk about interference, I need to explain something about our wireless router. We have an Apple Airport Extreme, not the most recent version but I think one version back from a couple years ago. While both our version and the newest version of the Airport Extreme allow either the 2.4GHz spectrum or the 5GHz spectrum, the new version allows you to use both simultaneously, the older version forces you to choose one or the other. Devices on our network that have to use the 2.4GHz band include the iPads and iPhones, possibly the Blackberry and definitely the TiVos, so we had our Airport Extreme set to 2.4 for everything. The Apple Tech suggested as an experiment that we set it to 5GHz and while the other devices would have no connectivity, we would be able to watch the iMac to see if it stayed connected. At that point we weren’t sure if it was good news or bad news, but switching to 5GHz definitely fixed the dropout problem on the new iMac. Steve got back in touch with the tech and got into a conversation about why this was working. At one point it was comedic because Steve was questioning the guy and he made the mistake of saying, “what’s YOUR engineering background?” To which Steve explained that he has a masters in electrical engineering with experience in antenna design! The thing that was bothering both of us was why would the NEW machine have a wifi radio/antenna that was WORSE than the other 18 devices in our house, and he couldn’t explain that. Steve and I got Bart onto a Skype call to talk this through with him. He suggested we download and install the free iStumbler application from istumbler.net and make sure we get the beta version 100. In that version there’s a tab called Spectrum. Using this tool you can watch the wireless network traffic around you and see not only which band the devices are on (2.4 vs. 5GHz) but also see which channels people are using. This allows you to see where the congestion is and how crowded the channels are to help you pick the optimal channel for you. This is when it got really interesting. Steve ran iStumbler on the two iMacs running side by side. What he found was that while the 24″ iMac saw 6-8 other networks, the new 27″ iMac was seeing 18-20 networks! So the antenna and RF receiver in the new iMac wasn’t worse, it was MORE sensitive, and so picking up more interference from other wifi sources. He was also able to see that just about every bit of the 2.4GHz band was filled. channels 1, 6 and 11 were all crammed full, and there was so much traffic that the space between those channels was bled into pretty badly. But then on the 5GHz band, there was just little old Steve fat dumb and happy with no interference. While it was very annoying to have the Apple tech be right, having actual facts and data to support what he said helped us to understand. Leave it to Bart to be able to help us! Now the solution options were that we could have bought a crappy second router, daisy chained it to the existing router creating a subnet that was just 2.4GHz, or maybe an Airport Express to do the same thing, or we could just buy a new Airport Extreme with the simultaneous dual-band capability. I’m not a fan of more crap on my desk, and I’m not a fan of high complexity, and I was able to justify in my head because I wanted to flow down my existing Airport Extreme to my son Kyle. I hadn’t yet confessed to Bart, but Kyle’s router is one of the vulnerable ones he warned us about a few months back and I figured this was an excuse to get that problem fixed and get ourselves the right wireless access point to solve our problem. This was a really enjoyable exercise for us because a) Steve’s wifi dropout problem was fixed, b) we got to buy new hardware, c) we got to play with data and graphs, and d) Steve did NOT have to cart his shiny new toy into Apple and be without it for a week or more. Using iStumbler was a lot of fun – it’s free so you might want to go play with it yourself from istumbler.net. A couple of weeks ago, my neighbor Tammy and her daughter Emmy came over while I was working on my car. They had Emmy’s laptop in hand, because Emmy had a problem. She said that her Macbook was telling her that her hard drive was full. I asked whether maybe she had a point and shoot camera and took lots of videos with it. I asked this because they use the avi codec for video and it’s REALLY inefficient, makes giant files unnecessarily. She said proudly that she had a digital SLR. ok, next question – are you shooting RAW by any chance? Why yes she was. And in fact, she not only shoots RAW, she really likes the rapid shutter release option so she takes, say, 500 photos at a football game! I figured this might be the problem, but I thought it would be good if we had some real data. I downloaded one of my favorite tools – Disk Inventory X from derlien.com. I’ve talked about this tool a lot of times but just in case you haven’t heard of it, it’s a tool that analyzes your disk and displays back to you a graphical representation of your files. 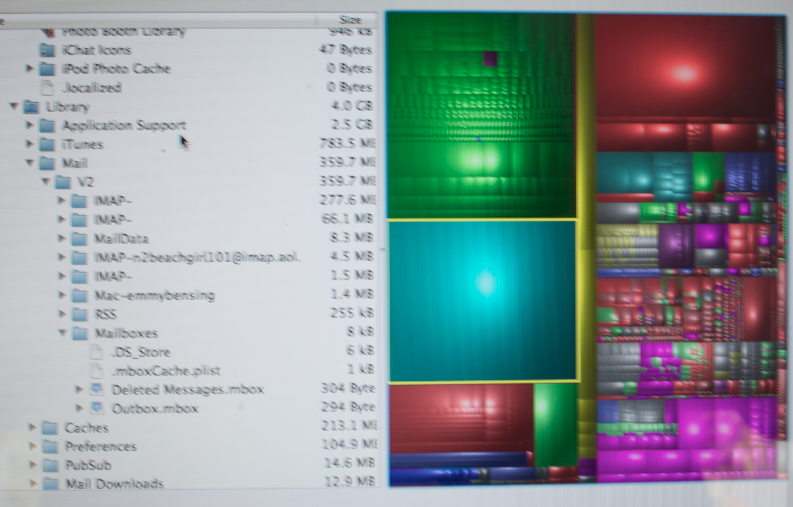 It displays rectangles of varying sizes and colors, size representing how much disk space is being taken up, and each color represents a different type of file. So for example, if you’ve got a 200GB iPhoto library, that might be a giant purple rectangle, but you only have a few small videos that might be a small yellow rectangle. If you click on one of these rectangles, it shows in the left sidebar the names and locations of all of the files. If you find say a huge video file you don’t really care about, you can simply delete it right from that list and Disk Inventory X poofs it out of the graph. It takes a long time to index a drive, quite a bit longer than Omni DiskSweeper, but I figured the graphical representation would be a help to them in understanding what had happened to all of her disk space. After about 10 minutes we got a big surprise. What we found was not AVI files, not a gazillion RAW images. We found 247GB of EMAIL! It was this GIANT blue rectangle filled with teeny tiny little blue rectangles. By clicking on a single little rectangle, the left sidebar revealed for us what mailbox had all this junk in it, and also showed us the size of the file. These zillions of emails were all 84.3MB in size. When I showed it to Emmy she took one look and said, “oh that’s an old AOL account I don’t even check any more. Delete it! That sure was a relief, I wasn’t looking forward to the chore of figuring out what were the good ones and what were probably spam. So with a single click in Disk Inventory X I was able to delete the whole darn thing. We asked Disk Inventory X to scan again and it came back with a lovely diagram with perfectly civilized sized rectangles showing her photos, music, etc. She walked away with 250GB of free disk space and all was happy. If you ever have a question about your drive and where all the space went, I highly recommend Disk Inventory X. I don’t think I’ve ever run it and recovered less than 20GB of space. Right after I ran this for Emmy, I went back to derlien.com and dropped $20 into the donation jar because I realized how much the developer had saved me over the years. Capt. Allison, Tech BeastMaster Bart, Super Steve, and NosillaCast-aways, Caleb aka Geekosupremo, on Twitter, here. First thank you Allison for your tip, I’ll be keeping that one in mind for the future. Why the future? Well when I found a few minutes in this nutty week to try your fix … Text Edit seems to have fixed itself. My thanks to the magical Mac gnomes that fixed that for me. Also I think I may end up going over to Rogue Amoeba for my audio stuff … although I may give the latest GarageBand a try. I know it has to be better than the version in iLife ’06. Now I’d like to give back to you all a bit. In your last Chit Chat Across the Pond with your lovely StevieP and Bart B(dot)ie, you all mentioned that there seemed there was not many tutorials for Motion. Well at one point in my life I thought myself a potential video arture (then I went into illustration/painting). But I never quite lost the video/film bug. Which is one of the reasons why I follow Alex Lindsay and the Pixel Corps. Stay with me the good stuff is next. Not long after MacBreak the audio show came out Alex started working on a video edition of it in the how-the-heck-do-we-get-this-out insane resolution of 1080p, way back in 2007 or so. As often happens the format and content of the shows began to drift apart, with the video show going more towards the pro level aspects of Mac use. So to better serve the community Alex and crew decided to take the one MacBreak show and turn it into several. The one that is of interest in this conversation is MacBreak Studio ( pixelcorps.tv/macbreak_studio ) This show covers the pro Mac apps including the Final Cut suite. There are quite a few episodes dedicated to the individual Final Cut apps. They may not be the most indepth tutorials but they will at least give an overview of a tool or aspect of the app, plus they’ll tell you where to get more training if you’re interested. Hope that helps Steve and Bart and anyone else that wants to tap into these pro level apps. Now coming down to the level of us mere mortals, who do not use the Alex as our monitory value – it’s the current cost of Photoshop so roughly 700 USD – I would like to compare my experiences working with Windows Live Essiantals ’11 Live Movie Maker and iMovie 9 from iLife 2011. Recently my wife took a video of an event at our church. There were a four ladies from the congregation speaking and a little Emcee intro for each. She was worried that there might not be enough space on the tape (yes I’m still in the DV dark ages with tapes) for all of it so she stopped the camera between speakers. Well at the end there was enough space on the tape for the introductions. The emcee graciously stepped to one side and reread her introductions. Now all that had to be done was to capture the video and chop it together with a couple of nice transitions. Since I am just coming out of the DV Dark Ages and just recently come into our new Mac I did not have a Firewire 400 – 800 cable or adaptor. This meant I couldn’t use iMovie to edit this. But then how can I compare them? More on that later. In this technological quagmire I remembered that my older Windows box had firewire, and that I had heard that the latest edition of Live MovieMaker was pretty good. Thus my switcher ways continue. The capture was easy enough, hook up the camera, tell the app I wanted to capture and it did the rest. I even split up the cuts in the tape. Which made my job even easier. Now I had a collection of clips, one for each speaker and then one clip that was the introductions recorded later. The importing into the app was a simple drag and drop, not unlike iMovie. Buoyed by this ease of starting I thought this would be a snap. I was mostly right. As a very basic NLE (Non Linear Editor) Live MovieMaker was very capable. It was easy to rearrange clips, split up the post recorded intros and apply transitions. While adding the transitions was easy well as easy as the ribbon interface gets,…the process of working with them left something to be desired. For starters the only “titles” they had were text on a solid colored background. Well that’s no dang fun! So I hopped over to iMovie to make some nicer splashier titles. This I then exported a DV compatible file…which Live MovieMaker wouldn’t open for some reason. Then I made an h.264 version and it worked … mostly, there was some black bars that I didn’t like – due to the difference in frame resolution, but it was better than blah text on a solid colored background so I just left them alone. Then I wanted to add some transitions between the clips. This is where Live MovieMaker begins to look, well not so hot. In iMovie, pretty much any of the editions, the transition editor was quite good if a touch opaque. There is relatively obvious options for duration or speed or what have you; in Live MovieMaker the default is to use 1.5 seconds, and only increment up to 3 seconds in half second steps. In iMovie when a transition is added you have a nice icon between the clips to make it obvious that they’re linked. In Live MovieMaker the clip that is the second half of the transition gets a little dog ear thing to show it has a transition, but it’s not obvious how you access the transition to change it if you wanted too. Also Live MovieMaker doesn’t seem to have a “fade to black” transition, to this I say, “WHAAAAT? !” Fade to Black or white is one of the most basic transitions in the history of transitions…or have I missed something? Before this becomes a tirade I found Live MovieMaker functionally complete but interface stupid. The ribbon was workable but I often felt like I was using it too much the simple editing I was doing. I prefer to have as many of my tools at hand like in iMovie and in Avid (which ia what I learned to edit on). Is iMovie getting a pass? Heck no! The first time I tried to use iMovie 9 I was cursing at the computer, which made my wife giggle a bit. I was trying to trim a video we had taken on our Canon SD1400 Digital Elph, and then export it for one of our ministers to use. Which granted is like using an assault rifle in surgery but it shouldn’t have given me rise to curse the name of iMovie or question it’s parentage. I did eventually figure it out, and it didn’t take as long as I though it would but it took longer than it should have. The main issue I found was that iMovie was trying to be helpful on the export end…which meant that it was trying to be smarter than me and that’s just frustrating. However now that I am aware of the “default” pitfalls I think iMovie and I will get along smartly. Now I just need a new cable so I can get the DV stone age to talk to the modern times. Thanks Caleb – what an interesting Frankenstein of a workflow you’ve created here. I admire your perseverance in cobbling these pieces together to make your masterpiece. Thanks again! Summer72H tells us about a free iOS app called Alarmed from yoctoville.com. Hey Summer – Alarmed is awesome! I installed it after I heard your review and set up an alarm to tell me to tweet out about the show an hour ahead of time. I was even able to make a repeating alarm so that every week at 4pm on Sunday I can remember to tweet about the live show. I also can’t believe how many cool options there are for different alarm noises. This is a freemium app – on the last page the developer talks about enhanced features you can get if you buy the paid for version for only $2. I might buy it just to support him, but Alarmed does everything I need in the free version! thanks for the hot tip. I was happy this week when I saw a couple of people tweeting about Clarify and ScreenSteps. They sent me notes talking about how useful they find both apps. I’m still in love with both of them – and one of the reasons is that they keep getting better and better. I know some day there will be a major rev update that they’ll have to charge us for but every enhancement so far has been for free. For example, you can export to Evernote now – directly. Think about how cool that is. I write myself a little tutorial, like how I can never remember how to edit my newsletter from one time to the next, and I simply push the little elephant in the menubar and boom, it’s on my Mac, my iPhone and iPad all synced up in Evernote. there was just another update today and now you can define your own PDF templates. You’ve been able to define your own templates in ScreenSteps for a long time but I was always terrified I’d have to know CSS. I just looked at the Clarify preferences and it’s all easy button pushing to create your own template. There’s six buttons for color of header, footer text, step titels and more, you can set the margins independently, add headers and footers and even define the fonts for six different elements like step title, step text and more. This is going to be fun! all of this for only $30 on the Mac or Windows or a cross-platform license for both Windows and Mac for $40. It’s even available in the Mac App Store, and of course there’s a link in the shownotes! This is Ken Wolf from Manhattan Repertory Theatre in New York City with an IOS AP that I love. Here is the problem that needs to be solved. I am busy. I need a good List manager for my iPhone so I can get stuff done. So I use Clear by RealMac Software. This application is the beginning of a new paradigm of IOS Apps. The reason I say this is: The main functions of this app are all GESTURE BASED. There are no little buttons in the main interface, and no arrows at the top and the bottom, so when you first open up dis app it is scary and it takes a little time to figure it out. When you first open up Clear, you are given a tutorial. DO NOT SKIP THIS TUTORIAL! This application is really confusing at first, but once you figure it out, it is great. Now Clear has 3 levels of navigation – one on top of the other. Now know this probably doesn’t make sense but let’s get down to the nitty gritty of using this application and all will become clear. Starting at the main menu, you can tap on the 1 at the right side of MY LISTS. What you vill see is a BLUE BAR that says PERSONAL LIST with an 8 on the right, but don’t do tap on it now. To create a new list, gesture PULL DOWN right above PERSONAL LIST and a new list bar will appear above it. Tap on the right side and an empty space will appear with a motivational quote on it. Tap at the top of this quote page and a red bar will appear and the keyboard so you can type in your first Item – then press done on the keyboard and there it is. To make your next item PULL DOWN from the top and you will pull in another red bar for your next item and the keyboard will appear again. Clear sorts all lists by priority – Top to Bottom. At the top, (If you use the default Clear theme – HEAT MAP) the most important items will be in Red and as you go down the list and as the priority is lessened, it slowly changes to orange. You can move an item up and down the list by tapping and holding on it and then moving it. You can SWIPE to the right to complete an item, Swipe to the left to delete and item, Shake to undo, Pinch two rows to create a new item in the middle and a whole lot more. To get back to your list of lists. Pinch from top and bottom and you will pop up to the blue List level. If you want to go back to the main level, Pinch again from top and bottom and you are back at the main menu. CLEAR has 5 different colored THEMES and a special sixth one will appear in your Theme menu if you have TWEETBOT installed on your iPhone. Isn’t that fun? A prize for being a Tweetbot Geek! There is a menu in CLEAR to adjust your setting with sound effects, vibration and more, A menu with Tips and Tricks and there is a menu to tweet to ALL the developers if you would like some help. This application for it is really slick. I love it and it is new and fun and different and I can’t explain it anymore for my head is exploding but buy this application. I think it is on sale now for 99 cents and if the sale is over by the time you hear this it vill be $1.99 but it is worth every penny. Sorry if this review wasn’t clear but once you try this application, it will be. Rod Simmons of the Simple Mobile Review Podcast reviews the Shure SE535 noise isolation headset. Last week we left George and his family lost in Tulsa with no data service . . . Huge savings aside, voice only pre-paid proved a non-starter. Daughter and husband are texting fanatics. His EMT diagnostic assistant requires live data. Their band plays obscure venues Navigation helps them find. So, game over, data and unlimited messaging required. Stuck on T-Mobile because that’s where our phones work, we gave ‘em a ringy dingy. Abridging an hour spent with customer service, we declined the upsells. Yes, we understood we qualified for new phones on our old plan, but, no, we didn’t want to spend hundreds buying them, then add the 5 GB of data each needed to best use their powerful features. We chose T-Mobile’s new bring your own phone and save money “Value Plan” and will save $400 a year. Blame inertia, but with my share dropping to only $30 a month, I moved too. I’ve put details about our plan choices in the shownotes. Glad you got this sorted, George. My buddy Niraj has been a huge fan of T-Mobile over the years for precisely the reasons you explain here. They are the one company that allows you to make compromises to save money. Even unlocked iPhones can use T-Mobile’s services, and as you mention you choose whether to pay for the super cool features or to save money if you don’t really want them. I was really rooting for the merger to not go through so that this competition continues to exist. Sophops report finding malware on 1 in 5 Macs – http://nakedsecurity.sophos.com/2012/04/24/mac-malware-study/(VERY broad use of the word “find”, emails in the spam folder even count!, less than 3% of Macs actually infected with malware). You guys must have missed the post that I did on the original episode where Caleb talked about his TextEdit quitting problem. In that episode Allison said that this was not due to a new feature of Lion. In fact, she was wrong. Lion has a new “auto quit” feature whereby If an app has no active windows, and you switch away from it, Lion reserves the right to auto-quit it, ostensibly to free up memory/system resources. I personally like this feature, because if an app doesn’t have any documents open, and it’s not my current app, I’m not using it. So it keeps my Dock and Command-Tab app switcher nice and clean. 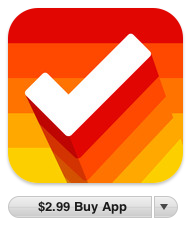 People are all up in arms about this feature because it makes them go through the trouble of relaunching apps. Well how hard is that? Either just click its icon, or use LaunchBar/Alfred/whatever to reluanch it, easy peasy. But if it does disturb you, there is a way to disable it; the info is in the Tidbits article I linked to above. I all the time download a full movie in parts, that’s always existing at YouTube, because my net connection is very slow and YouTube fulfils my desires.